The original brief was to design concrete planters for a rather forlorn left-over space between the new £81 million Diamond building, designed by Twelve Architects and the equally distinctive geometric Jessop West Humanities building, designed by Sauerbruch Hutton. The space is part enclosed also by the Music School housed in the former maternity hospital’s original Gothic grade II Jessop building and the glazed facade of the landmark bio incubator building. These surrounding buildings presented both a challenge and an opportunity that resulted in the inspiration for our conceptual idea and a determination to create a remarkable space that could unite these building and their particular use. The Greening of Sheffield initiative inspired by Professor Nigel Dunnett was also a driver in the development of our ideas. Our site was the misshapen area left between buildings that don’t talk to each other. It was bleak, hemmed in, and unwanted. Greenery needed to break it up, soften, bring life to this space in the same way greenery is being encouraged to invigorate the built environment all over Sheffield. But nature is not reclaiming the city by itself; humans are helping. Planning, design and technology are feeding the greening of Sheffield - and as it is fed, so it will grow, one outcrop reaching another and merging. These thoughts gave us the image of a garden into which humans are pouring water, and which seems to be growing outwards. Students from both sides of the old arts and sciences divide, need to enliven the society they share, by pooling different ways of seeing the world. The society they share is a garden and an exchange of ideas produces a flowering - a garden that grows. Twin paths draw people from opposite sides of a garden, to twin seating areas in the middle. Two giant metal ladles pour water into the ground. Ladle-sculptures that give a nod to Sheffield’s cutlery-making tradition, particularly the craftsmanship of the Little Mesters. 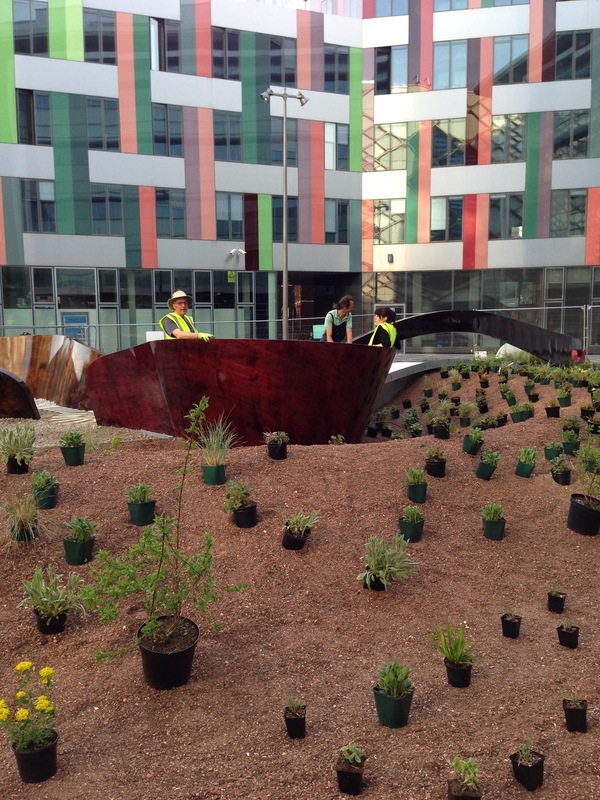 The ladles seem to pour water, but what they actually feed the garden with, are students from both sides of a traditional divide - one ladle brings the arts students, the other brings the science students. Arts and sciences represent different approaches to investigating the world, but both are expressions of the same creative impulse in humans. Both ladles are identical in form and material, but each has a different finish. The central paving holds two sequences of words that reveal contrasting processes of thought, one drawn from a more analytical scientific process, and the other from a more creative perspective representing the arts. Each ends with the word Share, and throughout their differing sequence, there are words that are common to both processes. At the centre of the garden lies a small circle - a drop of water poured from twin ladles, a drop of inspiration produced from the sharing of ideas. Outwards from this central circle spread ripples - concentric rings of hard surface and planting, followed by ripples in the landform. The movement of these ripples out from the centre has left the garden with a ragged outer edge creeping into the existing paving. Near the perimeter of the garden, trees have taken root. 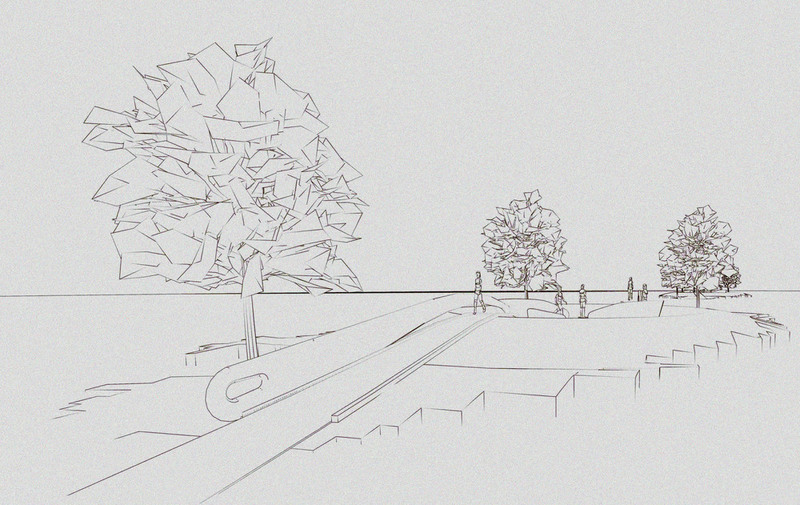 Our concept also included, further out, smaller secondary areas of greenery, bringing with them more trees. Each of these outcrops of growth is fringed by its own creeping edge. The garden seems to be spreading out of the site like lichen colonising a rock-face. Galvanised steel with a decorative lacquered finish was the chosen material, options were also presented in wood and bronze. The decking of the bridge sections consist of a bound aggregate and the central area infilled with concrete and a bonded aggregate finish. The poem was carved in contrasting limestone. The landform was created from a lightweight substrate often used on flat roofs, with good properties of water retention. 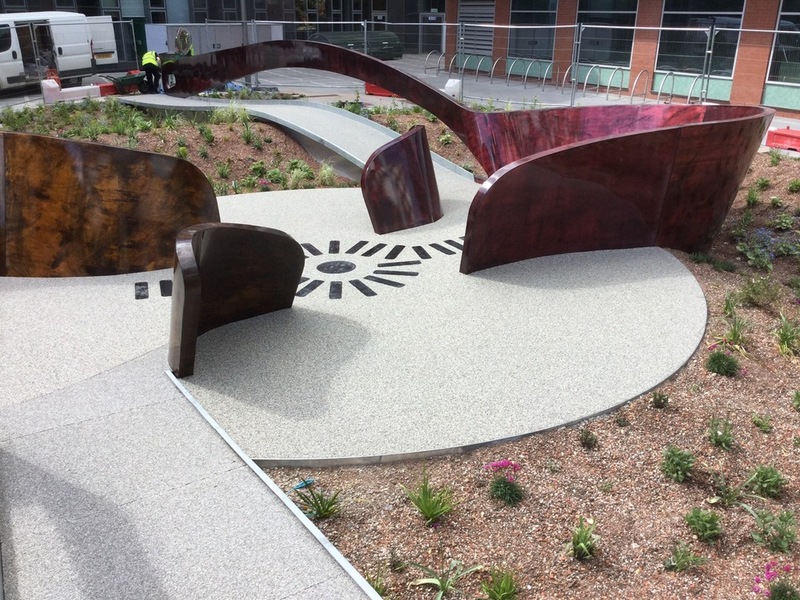 The planting scheme was designed by Professor Nigel Dunnet and planted by the in-house landscape team. The steelwork was fabricated and installed by Chris Brammall Ltd.